888 Tres Ochos Tequila was created with a commitment to the denomination of origin and the worldwide recognition of Mexico’s tequila heritage. Originating in the fertile volcanic soil of the lowlands of Jalisco, Mexico, made from 100% tequilana azul weber agave, with a taste and quality reminiscent of tequilas historically crushed by tahona roca, 888 Tres Ochos Tequila is distilled and bottled in Mexico for the aficionado with a discriminating palate and those who appreciate the finer pleasures in life. 888 Tres Ochos Tequila was founded in an era that ushered in high quality premium brands of 100% blue weber agave tequilas. The transition from party shots to elegant sipping tequilas started with “Tequilas Finos” being savored neat in a snifter, chilled or on the rocks. Handcrafted, 888 Tres Ochos Tequila captures the heart of Mexico, the pure spirit of 100% agave, celebrates the history of tequila and the philosophy of Asian beliefs. Health, Luck and Prosperity, symbolize both the importance and intrinsic value of the numbers “888” in Asian society, creating a cross-cultural alliance with unparalleled brand recognition with 888 Tres Ochos Tequila. A global tequila with artistic inspiration from Europe, logistics from Singapore combined with the production of exceptional "fine tequilas" from Fabrica de Tequilas Finos in Tequila, Mexico, harmoniously create 888 Tres Ochos Tequila. 888 Tres Ochos Tequila 100% blue agave Silver, Reposado and Añejo are hand crafted by master distiller Señor Arturo Fuentes and Fabrica de Tequilas Finos to deliver an extremely smooth award-winning tequila of reverential sophistication. 888 Tres Ochos Tequila is premium tequila at it’s best, bottling the exotic allure of past, present and future. 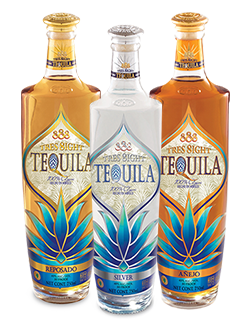 888 TRES OCHOS SILVER is a premium 100% Blue Weber Agave Tequila created, bottled and exported from Tequila, Mexico. It is reverently produced from the heart of the Agave pina, double distilled, crystal clear, lightly peppered with a sweet freshness of roasted Agave infused with fruit undertones and a delicate sachet of spices, culminating in a smooth elegant finish. 888 TRES OCHOS REPOSADO is a premium 100% Blue Weber Agave Tequila, distilled, bottled and exported directly from Tequila, Mexico. The pride of Fabrica de Tequilas Finos is extra rested in oak on average of 11 months, producing a golden amber color, balanced with sweet tones of roasted agave, with vanilla, prune, coco and an array of traditional spices yielding a smooth viscosity with good body and a hint of wood inherent to exceptionally fine Tequilas. 888 TRES OCHOS ANEJO is a premium 100% Blue Weber Agave Tequila, bottled and exported from Tequila, Mexico, meticulously aged for approximately 3 years in small oak barrels producing a beautiful dark reddish amber color infused with notes of sweet baked Agave, tones of vanilla, prune and chocolate balanced with an array of spices complimented by a whisper of barrel aging characteristic of exceptionally smooth ultra-premium Tequilas. Copyright © 2016 : All Rights Reserved 888 Tres Ochos ® 888 SPIRITS Co. Pte. Ltd.